Michael Weinzettl muses on their increased presence in ads this year. A film version of the King bestseller has just opened in cinemas worldwide and a second installment to the film is planned as the movie only covers the early part of the novel. The concept of the evil clown is related to the irrational fear of clowns, known as coulrophobia. There is even academic literature on the subject: Cultural critic Mark Dery has theorized the postmodern archetype of the evil clown in "Cotton Candy Autopsy: Deconstructing Psycho-Killer Clowns. Although clowns have cropped up in advertising since the very beginning, the first clowns in an ad that really impressed me were certainly of the evil kind, namely in a spot for Philips widescreen (21:9) from 2009. It was made by Tribal DDB, Amsterdam, and was awarded with the Film Grand Prix at Cannes that year. They may have heralded the whole "Creepy Clown" prankster phenomenon that had its origins in the UK but from 2014 swept parts of the US. Philips: "Carousel" [02:19] A movie-quality spot for the Cinema 21:9 TV from Philips. We find ourselves caught up in a street battle, yet it would appear that time has somehow stood still. Slowly, the camera glides between bullets suspended in midair and exploding cars, past policemen and criminals disguised as clowns, and on into a building. A policeman is in the process of flying through a pane of glass, the shards of which we are able to examine in detail. Swathes of flames and banknotes fill the lobby area, along which we then advance until we reach a room in which a man is lying unconscious on the floor. Amusingly, the beginning and the end of the spot mesh seamlessly. Clowns of another foolish kind, featured in a recent commercial for Audi that had the theme of "Serious technology. Silly situations. You never know what you might encounter when you are out driving." Audi premieres a major technology campaign that enlists the stars of the circus but to convey a serious message. Created by BBH, the multi-million pound campaign illustrates the benefits of Audi intelligent technologies. Clowns, shot by award-winning director Ringan Ledwidge, features a troupe of the comic characters taking to their collapsing cars and causing havoc on the roads with their antics. A range of Audi models calmly saves the day with their hi-tech safety capabilities. The technologies include Audi pre-sense city, cross traffic rear assist, quattro all-wheel-drive, Matrix LED highlights, adaptive cruise control and Audi side assist. 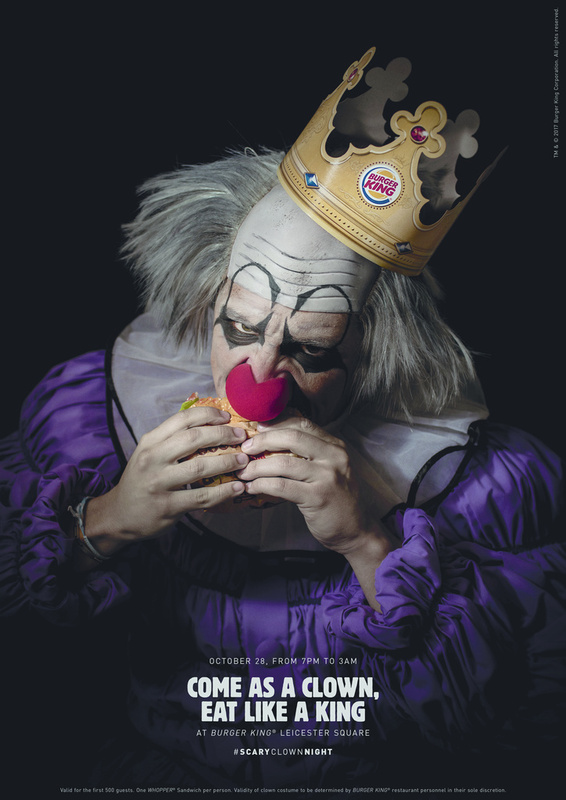 In print, the most visually arresting clowns of the year featured in the recent Halloween campaign for Burger King by LOLA Mullen Lowe, Madrid. 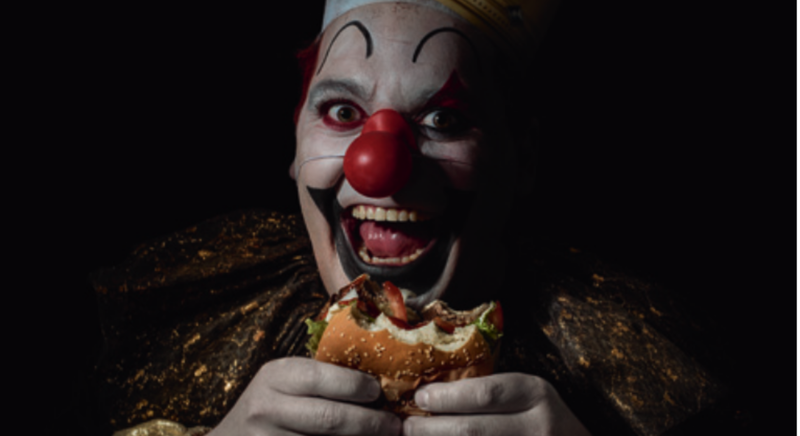 "Come as a clown, eat like a king" is the headline and it offered free Whoppers to customers who wore clown costumes on Halloween – and thus not so subtly referencing rival mascot Ronald McDonald. (A mascot I must say I've always found rather unappealing, if not somewhat creepy. Perhaps, I too suffer from coulrophobia.) The brilliant execution is by photographer Ale Burset who depicted the assortment of clowns – some of them quite creepy too – with his usual, almost old-masterly touch. 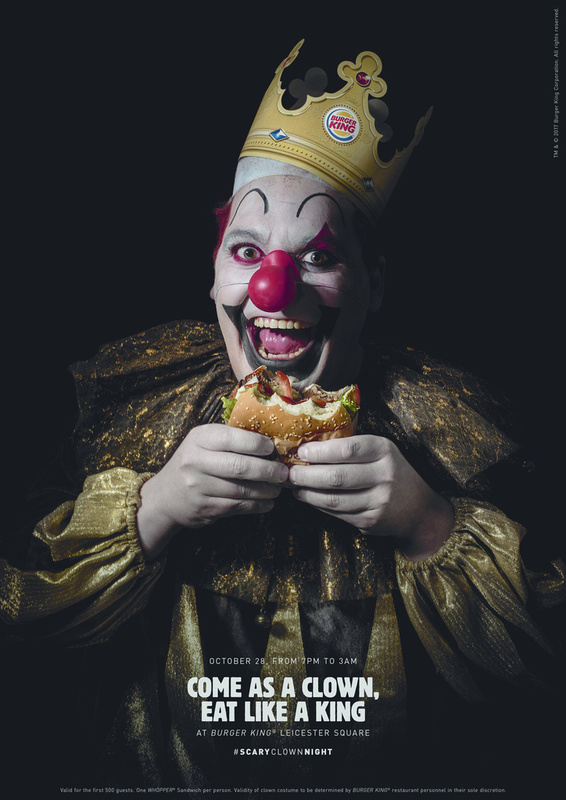 A kind of "haute cuisine" version of a creepy clown even made it on to the cover of Vol. 5-17. 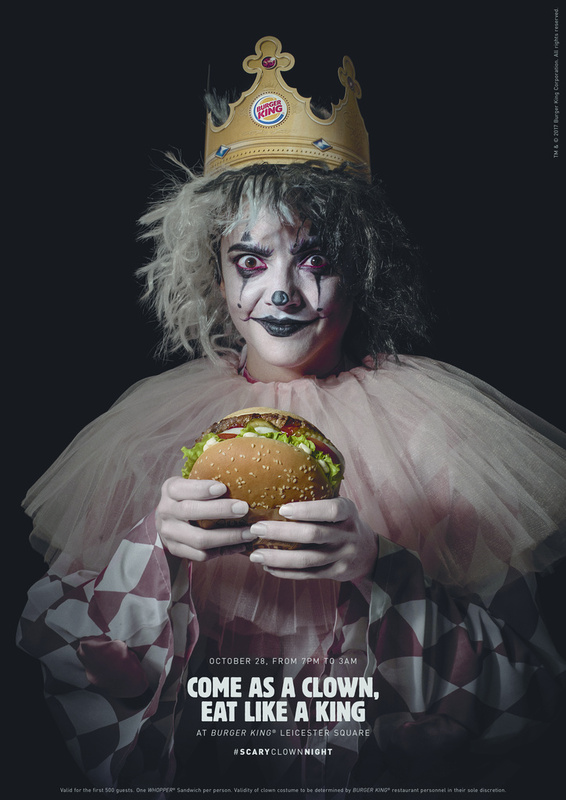 It came from a Dutch poster campaign by J. Walter Thompson, Amsterdam, to announce Food Exhibitionism, an event celebrating the many ways in which food is a vessel of culture and societal trends. 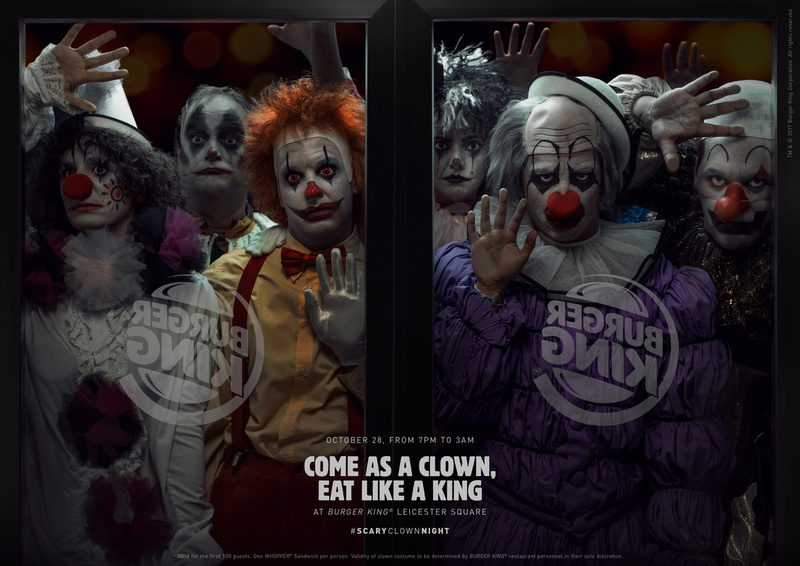 The ads were created by JWT, Amsterdam as collaboration between Creative Director Robert Harrison and the agency's own chef Robbie Postma. 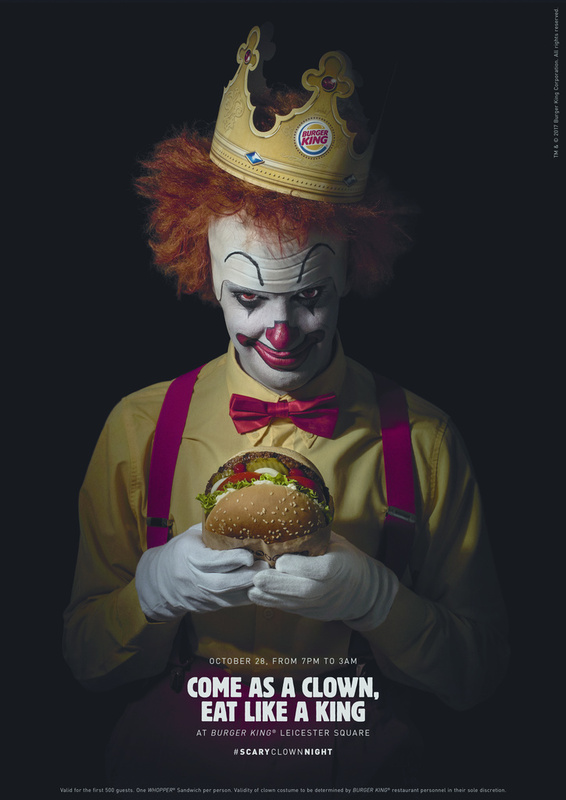 So much for a trend in advertising that caught my eye – one that isn't so very surprising considering one of the creepiest of clowns can be found right in the White House of the United States of America. 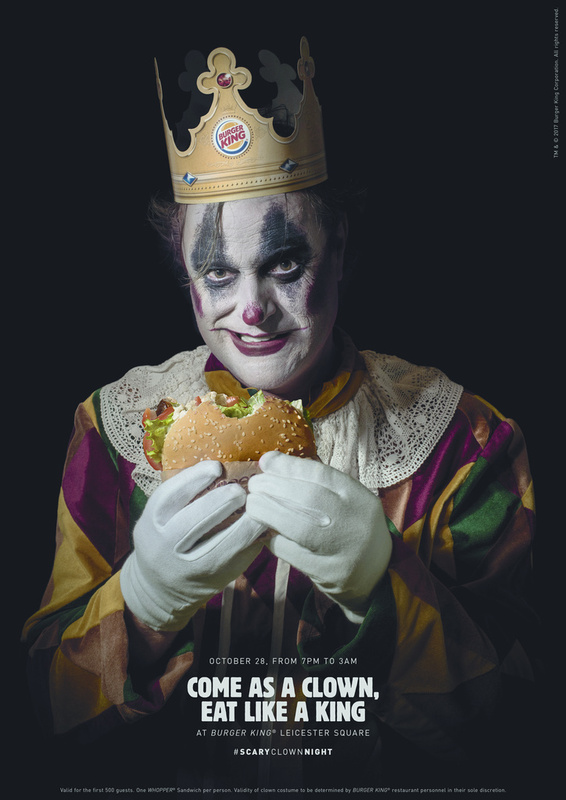 Client: Burger King. Agency: LOLA MullenLowe, Madrid. Creative Director: Tomas Ostiglia, Francisco Cassis, Fabio Brigido. Art Director: Pedro Sattin, Tom Elliston. Copywriter: Alvaro Palma, Jose Sancho. Photographer: Ale Burset. Illustrator: Diego Speroni. Typographer: Pedro Sattin. Digital Artist: Diego Speroni. Poster campaign to announce Food Exhibitionism, an event celebrating the many ways in which food is a vessel of culture and societal trends. Agency: JWT, Amsterdam. Creative Dircetor: Robert Harrison, Robbie Postma. Art Director: Bas Korsten. Copywriter: Marcel Hartog. Photographer: Robert Harrison.